It’ took me a few hours to think about this topic. Well, not exactly a few hours, more like a few days. Whenever I am asked about my childhood, the best memories that comes to mind are the ones spent with family. Sunday picnics, evening joyrides, breakfasts at the park, summer beach outings or just a simple bonding moment around the dinner table. When I was younger, about twice a month, our family goes on picnics at Burnham Park after Sunday service. We would bring food with us so we didn’t need to buy food outside (although there were times that we would, too). During those days, the park would be filled with families having their picnics as well. Activities after lunch varies, too. There are times that we would go boating at the lake, go biking at the children’s playground or go skating. There were also times when we would just walk around the park and watch the bikers or the skaters. My Dad used to be a taxi driver. There were times when he would take the whole family out for a joyride after dinner. There would be no definite destination in mind. We would decide where to go once we’re on the road. There was this one time when we visited an abandoned place where a hotel used to stand. The hotel was destroyed during the 1990 earthquake. They say that the people who died still haunt the place today. Based on the stories, when people passed by the area, they would hear people crying. Just for the heck of it, we visited the place at night, turned the car engine off, even the lights and kept quiet, trying to listen for the crying voices. I think we stayed that way for about half an hour but no one was able to hear anything. No ghosts, so to speak. Then there was also the time when we went to the top of a hill to watch the city lights at night. The view from that place at night was beautiful. During summer vacations, my Dad and I would jog early at dawn and come home in time for breakfast. Then my brother joined, then my sister and eventually my Mom came with my youngest brother. That was when the breakfasts at the park started. We would pack food and drinks and buy fresh-baked bread on the way to the park and eat breakfast there. Then we would watch several groups of people doing tai-chi and other morning exercises. Afterwards, we go home and do the usual chores that we have. The simplest bonding moment that we had as a family was just sitting at the dinner table after dinner talking about whatever we could think of. We talked about school activities, my parents’ childhoods, or even current community events. It would take us a couple of hours sitting there before clearing out the dishes. We wouldn’t notice the time until it is already time for bed. I couldn’t think of just a single moment that I could call my best childhood memory. I guess the days spent with my family would be the best childhood memories that I have. I think it’s not easy to capture special moments. This was a photo that I had taken a couple of weeks back. 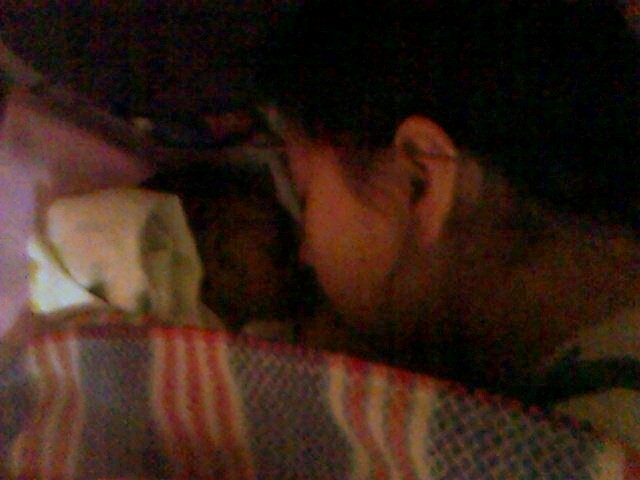 My son was asleep after his morning bath and feeding and his sleep was so peaceful, too. With nothing else to do, I took off his mittens and was inspecting his hand when it came to mind how small and fragile his hand was. I initially took this photo to somewhat document a moment when his seems small and fragile. It was later on that I realized that the photo represented a promise that was made. And the promise was that, no matter how old and how big my son gets in the future, I will always be there to hold his hand. I know it should just be one photo per day but then hey, it’s my blog anyway so I will post what I want. LOL! 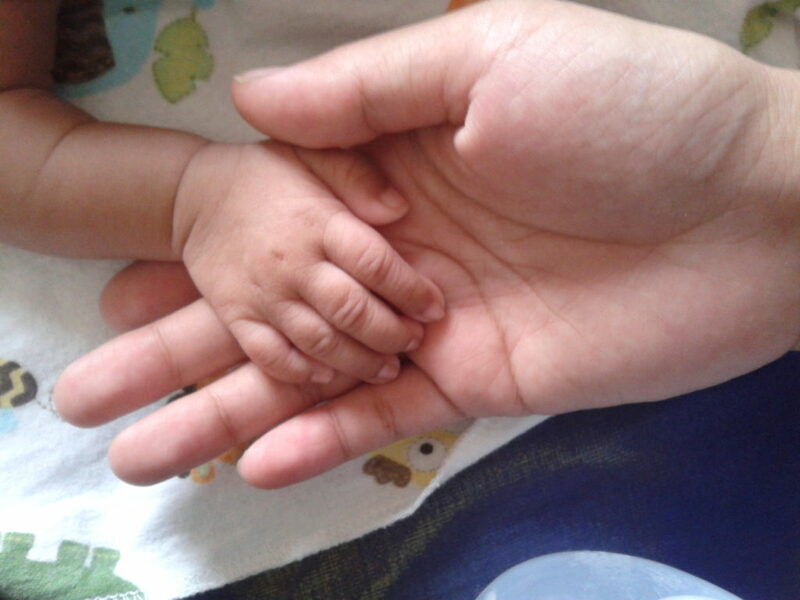 Anyway, there was also this photo that my Mom took of me and my little one when he was about three weeks old. Such a sweet photo and sentiment. Thanks for sharing your fun childhood memories too.